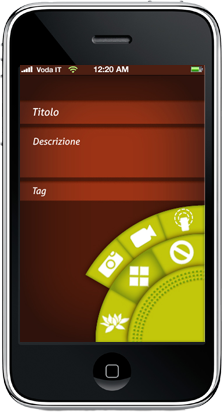 Trace is the design of an iPhone application and its graphic interface. It allows people to record and share their routes and experiences. Its user-generated geotagged travel contents comprise notes, tips, photos, videos and audio recordings, which are uploaded into a database and can be consulted by the Trace community. Users can individually augment or modify existing routes, characterizing them and making them unique. The Trace system and software are applied here to the Castelli Romani national park, near Rome. Basic to this thesis is the concept of place. Our emotions, our memories and our past experience give to a specific location very distinct meanings, connected to the people who live there or leave their trace in it. Such a place has a multiple identity, formed by many perceptions. It is a mixture of emotions, a changeable shape moulded by human comings and goings. this is the video that I showed at my thesis degree presentation on April. For this project I imagined users about 20 to 35 years old of a carpe diem mentality: they want to experience their surroundings intensely. They don’t like making plans for the day, because anything might happen which would totally change it. Once arrived somewhere, they don’t waste time looking for tourist guides or consulting books. They want to experience the place as an inhabitant, not a foreigner. They want to know the most interesting thing nearest to them, and wander informed by the advice of those who have already ‘lived’ the place. They may be hikers, for instance, or cyclists. The project’s stakeholders are volunteers of the Frascati branch of the Club Alpino Italiano, and the land surveyors of the Castelli Romani park who constantly control the state of routes and their danger. The Castelli Romani, near Rome, is a typical example of a national park which is not a mass-tourism destination and whose landscape is currently unsignposted. Trace could, however, create a national network of places, thus revealing their different characteristics. People create their routes through the iPhone’s GPS. In these routes they can add any kind of contents. The data are transmitted to a database that is controlled and moderated bypeople of Cai of Frascati and the staff of natural park of Castelli Romani. Then all the routes could be consulted in a specific section of park website through personal account and directly on the iPhone. 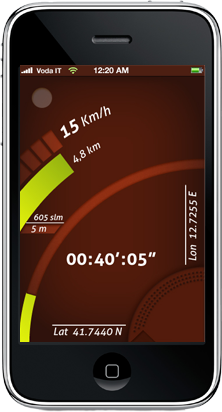 When a user chooses to start to record his route, a statistics screen shows speed, distance, elevation, time, longitude and latitude. When the user chooses to geotag a place or object a screen appears in which he or she can insert a title, description, tag and any kind of multimedia content. 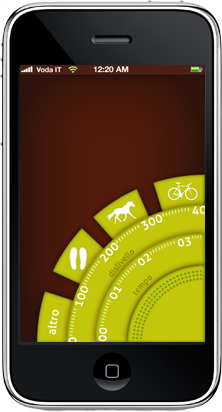 If the user wants to find a route, he or she can check all the filters (time, elevation, means of transport) and start the search. 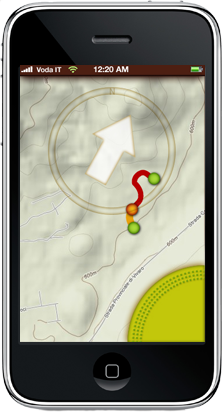 If he or she chooses a specific route after the search, a map is accessed with a compass for travelling in the same direction. Here is my final presentation. Here in my report pdf (low resolution).